For a war that affected nearly every country in the world, only a few nations seem to get mentioned when we talk about World War II. Germany, England, Russia, Japan, and the United States are sure to come up, but many more countries get left out. The other nations of the world were involved, though—and we forget that some of those places did a lot more than you might realize. 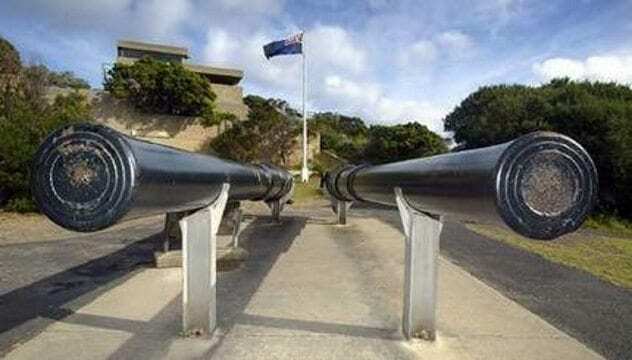 On September 4, 1939, the morning after Great Britain declared war on Germany, a boat passed by a fort at Point Nepean. The fort’s personnel called for it identify itself, and when it refused, they became panicked that it might be a German ship, bringing the war to Australia. The fort launched a warning shot across the bow of the ship, sending what some consider to be the first Allied shot of World War II. The shot itself isn’t that remarkable. The ship turned out to be Australian after all, so it wasn’t even against an enemy ship. The gun battery, however, is. By sheer coincidence, the very same battery also fired the first Allied shot of World War I. The Australians would fire many more. By the end of the war, 27,000 Australian soldiers had given their lives. At the beginning of World War II, Canada was not a major military force. Despite its large size, it had a population of only 11 million and was armed with a navy of only 15 ships and an air force of 235 pilots. When Germany invaded Poland, though, the Canadians started getting ready. In ten days, Canada invested $20,000,000 into building up its armory—and they started building. They trained nearly 50,000 pilots and built 800,000 trucks, 471 naval ships, and 16,000 aircraft. And they sent 730,000 men off to fight. They were the biggest contributors to the British air training plan and gained a worldwide reputation for their air force. 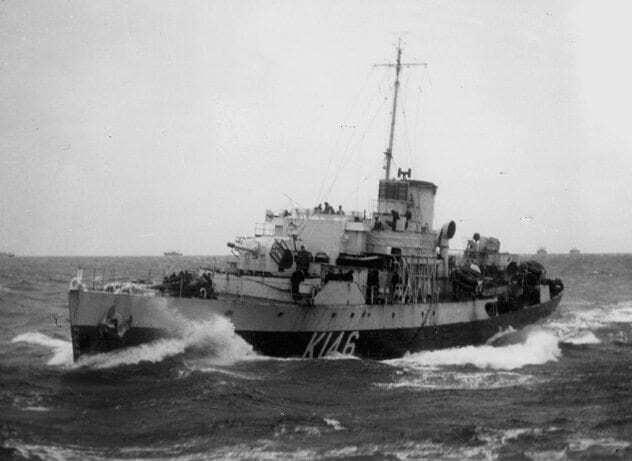 Most amazingly of all, by the end of the war, Canada had the third-largest navy on the planet. When India called on its people to fight, they signed up. 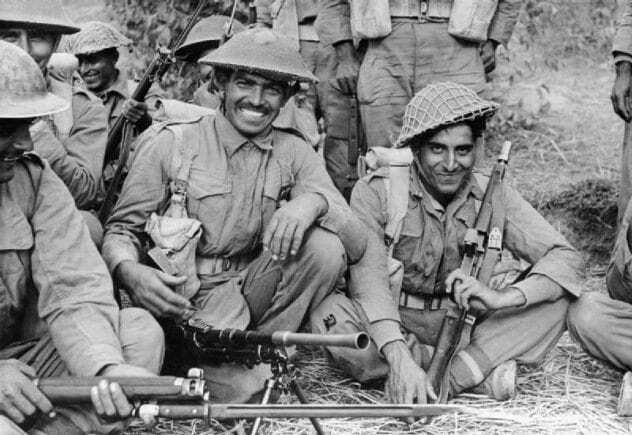 An incredible 2.5 million Indian men volunteered to fight in World War II, forming the largest volunteer army in the world. Not every one of them ended up on the front lines. Some worked in factories or defended the country against air raids. Those who did, though, made a massive difference. One group called The Fourteenth Army, a mixed force of British, Indian, and African soldiers, recaptured Burma. It was a turning point in the war, and by the end, 30 Indian soldiers had earned the Victoria Cross, the highest British medal of honor. 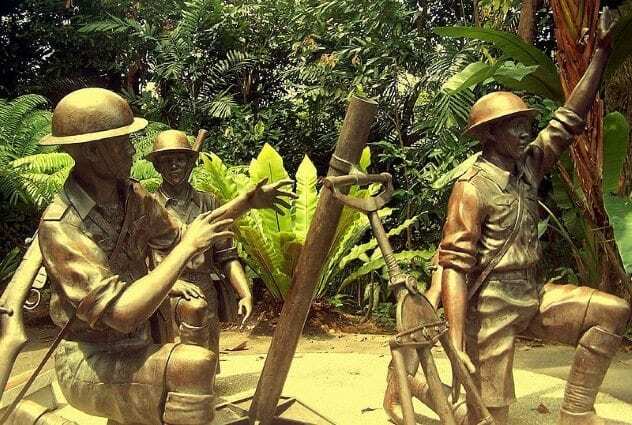 In 1942, the Japanese advanced on Singapore, a major strategic point for the British army. England’s military base there was their access point to Asia, and without it, they would be at a major disadvantage. England’s last stand, though, wasn’t fought by British soldiers; it was fought by Malays. A man named Adnan Saidi and his unit held the ground at Opium Hill, determined to hold against the Japanese to the last man. At one point, a troop with turbans on their heads dressed in British-Indian uniforms came toward them. At first, they seemed to be a relief army from India, but Saidi noticed something was off. These men marched in lines of four, while the British usually marched in lines of three. They were Japanese soldiers in disguise. Saidi’s men opened fire, and the assault was stopped. After that, the Japanese got frustrated and launched an all-out attack. Still, Saidi and his men stayed and fought, shooting until the last bullet was fired—and fighting with bayonets after that. All but one man died. The Japanese overran the place, and Britain lost its key base in Asia. But the Malays, at least, gave them a fight. The Swiss didn’t just sit there and let World War II happen. Officially, they were neutral, but they still played a role. They didn’t want the war coming across their borders, and they defended their airspace. At one point, this meant shooting down 11 German planes that entered Swiss airspace en route to France. The Germans were furious. They demanded an apology and threatened to retaliate. The Swiss, though, threw the blame right back at them and demanded that they stop flying over their land. 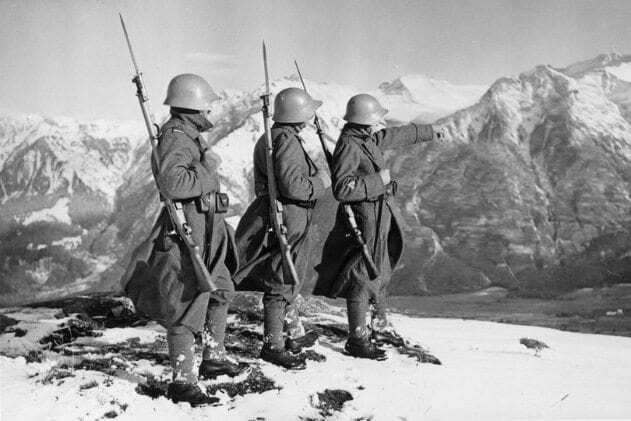 When the Allies started fighting back, Switzerland wasn’t always left alone. Some of the bombings meant for Germany landed on them, including a US bombing that killed 100 people. The Americans insisted that it was an accident, although the Swiss weren’t so sure. By the end, the Americans had blasted Switzerland with enough of an onslaught that they had to pay more than $14 million in damages. Nearly 100,000 Kenyans signed up to fight in the King’s African Rifles. They were, by far, the biggest part of Britain’s African army, making up one-third of its soldiers, and they played a big role in the war in Africa. 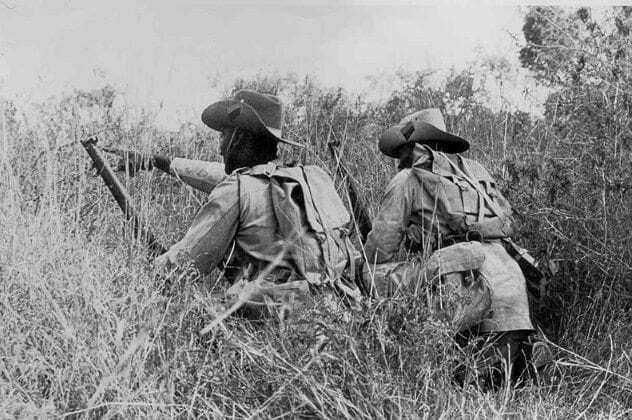 The Kenyans defended their land against an Italian invasion and helped the King’s African Rifles fight—and stop—the Italian invasion across East Africa. After that, they went on to Madagascar and Burma. The Kenyans struggled with racism throughout the war. African soldiers were paid less than white ones and could never be promoted to a commanding rank. Still, they found some ways to take advantage of the stereotypes against them. One soldier told a writer that, to terrify Japanese soldiers, the Kenyans would pretend they were cannibals getting ready for a taste of Japanese. Alan Turing gets all the credit, but he was actually the second person to crack Germany’s enigma code. The first was Marian Rejewski, a Polish cryptographer. 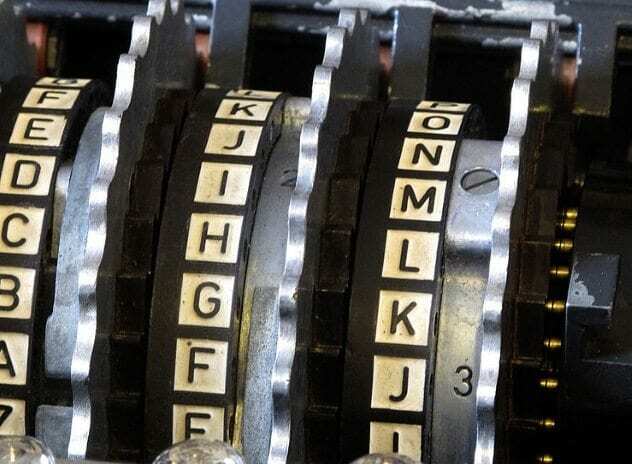 As early as 1932, Poland had started work to crack German’s complex enigma code. Working with documents stolen by French spies, a Polish team struggled to duplicate the enigma machine—and it worked. Rejewski managed to solve the cypher and made the first duplicates of the enigma machine. Unfortunately, the Germans realized that their code had been cracked and increased the complexity tenfold. The Poles were stuck, and in 1939, realizing that an invasion was imminent, they sent all their work to England for the British to carry it on and braced for the worst. That work made it to Alan Turing, who built on it to crack the more complex code, but he never would have done it without the work of Marian Rejewski. In 1939, Finland entered World War II. The Soviet Union had been trying to barter a trade, wanting control of several Finnish islands, but when Finland refused, they moved their troops in. The Soviet army was massive. There were one million troops marching on Finland, leaving them outnumbered three to one. Finland called for help from Britain and France, but none came, so they had to fight the Soviets themselves. Finland lost—but they dealt a major blow to the USSR in the process, killing 320,000 Soviet soldiers. Finland only suffered 70,000 casualties. The Finnish had to give up some of their land, but they shot a major hole in the Soviet army. In Armenia, a small mountain village called Chardakhlu played an incredible role in World War II. 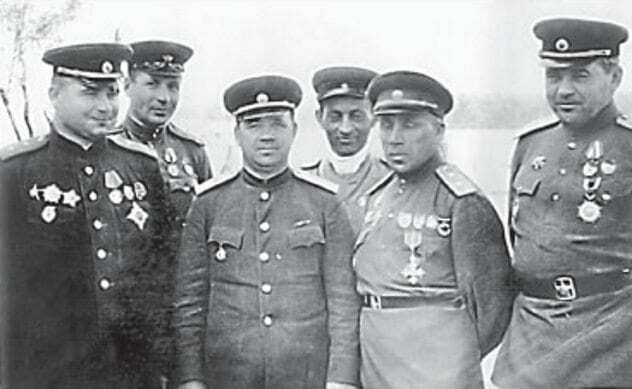 Of the 1,250 villagers who were enlisted to fight in the Soviet army, 853 were awarded medals, 12 went on to be generals, and seven became heroes of the Soviet Union. Two men from the little town made it to the highest echelons of the Soviet army. Hamazasp Babadzhanian became the chief marshal of the armored troops of the Soviet, while Ivan Bagramyan became the marshal of the Soviet Union. By the end of the war, the little town had some of the most decorated fighters in the country. Nearly every man came home with medals on his chest—or didn’t come home at all. Admittedly, Russia isn’t exactly an overlooked country in World War II. It’s well-known that Russia played a major role in the war, but most people don’t realize how massive that role was. We’ve heard a lot of boasts about the United States turning the tides of the war, but the credit really should go to the Soviet Union. The Soviet Union was responsible for 80 percent of all German casualties. And the USSR came into the war late. If we start counting from 1941, the Soviets are responsible for 95 percent of all German casualties. 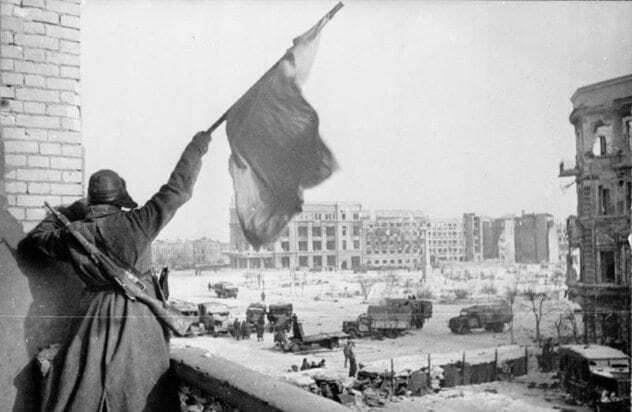 A lot of this happened during the Battle of Stalingrad, where Russian soldiers wiped out 20,000 German men each day. Russia’s army was more than big; it had its fair share of talent, too. 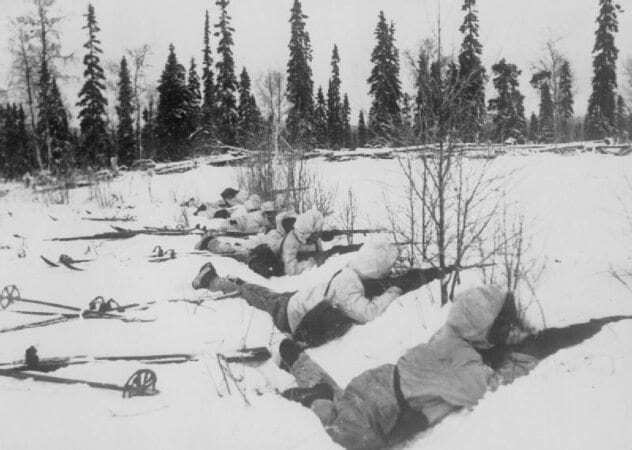 Nine out of ten of World War II’s deadliest snipers were from the USSR. The Soviet Union didn’t just play a role in the battle against the Germans—they completely devastated them.